After last month’s dip into more surreal humour, The Fourth Doctor Adventures now adds a political edge to its headier science fiction as a mysterious invasion of Earth turns much more complicated. While the Doctor and Romana attempt to discover the underlying motivations of the Laan, Earth’s newly-elected President, Sheridan Moorkurk, begins to understand that Cuthbert and his megacorporation The Conglomerate hold more power than anyone has ever realized. Tom Baker and Mary Tamm are once more excellent, and the inclusion of John Leeson as K-9 adds another layer of authenticity to events even if a time spillage interferes with his robotic systems and the sands of the Sahara Desert necessitate his staying behind in the TARDIS. Baker, in particular, excels when the Doctor is asked to drop all humorous pretenses and show his true compassion for Romana as he desperately searches for her. Romana, still fairly new in her introduction to the universe and to humanity, is appalled that humans’ natural reaction to the unknown is aggression, and it’s intriguing to see her try to negotiate with those in charge to change viewpoints. Of course, the Fourth Doctor era has always worked best when the Doctor has a strong presence to go up against, and David Warner unquestionably provides that as the powerful and shrewd Cuthbert, his scenes with the Doctor absolute standouts. 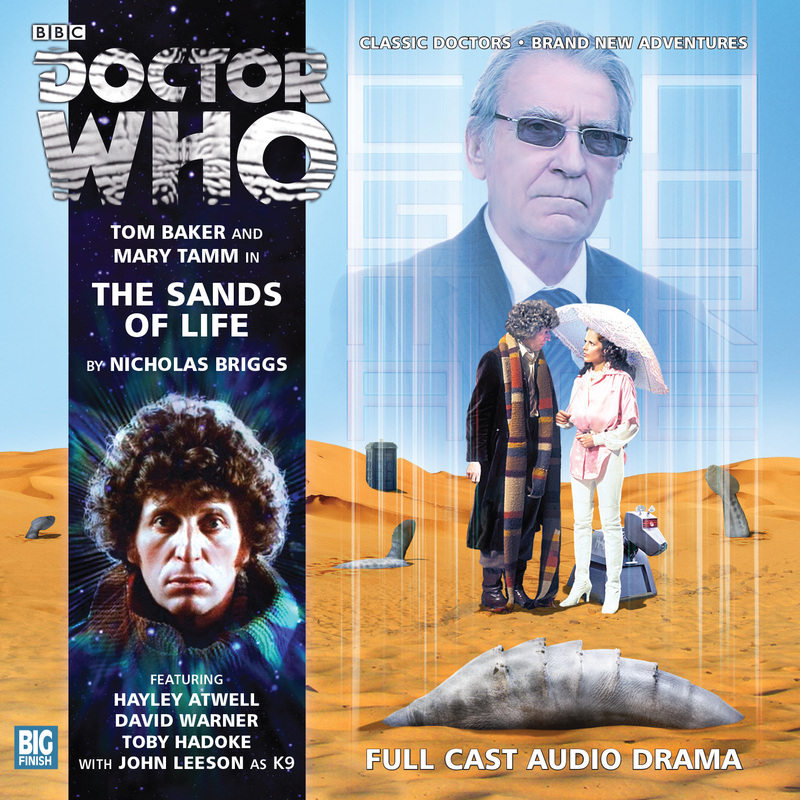 ‘The Sands of Life’ opens in grand fashion as millions of Laan creatures head toward Earth, and the inclusion of space and the Sahara gloriously breaks free of the conventions of Doctor Who to tell this very visual tale. Nicholas Briggs effortlessly introduces the political climate and Cuthbert’s Conglomeration with its hidden role in global energy, technology, and finances, and Cuthbert’s time technology experiments at the heart of the matter are well-realized. It’s rare that a novel alien species captures the imagination so completely, but the vortex-dwelling Laan looking to give birth on Earth using temporal energy is a wonderful conceit, one fraught with danger as the sheer magnitude of temporal energy involved threatens to tear the planet apart. ‘The Sands of Life’ may ultimately simply be exposition as pieces are maneuvered into position for the concluding ‘War Against the Laan,’ but the exposition is some of the strongest that the audio medium has yet to offer. Whereas ‘The Auntie Matter’ was much more focused on character drama and development, ‘The Sands of Life’ instead presents an incredibly action-oriented and visual tale that only slows down for a slightly protracted interrogation sequence that doesn’t accomplish too much aside from getting all of the characters on the same page. Still, with David Warner’s beguiling performance as the enigmatic Cuthbert proving a worthy foe for the Doctor and Romana and the Laan instantly making their impact felt as their natural cycle of life threatens the entire planet, ‘The Sands of Life’ uses a multi-pronged approach to steadily keep its central mystery unfolding while further developing its plot. Though none of the other supporting character end up being too developed or memorable, the focus on Cuthbert and the Laan is more than enough to carry this release and maintain anticipation for the conclusion.